The country's existing housing policy should move towards constructing apartments in suburban and rural areas, in compliance with issues relating to the environment and land use, President Maithripala Sirisena yesterday said. President Sirisena pointed out that it is extremely important to adopt a sustainable housing policy when planning settlement development projects in the suburban and rural areas. “Eventhough the population rate increases, our lands do not expand. Our country is a small island. We are not able to continue with developing villages allocating land plots for each house. We do not have enough land available for that anymore, not only in the urban but in t herural areas as well.Apartments are a better solution to solve the land issue,” the President further pointed out. President Sirisena pointed out that the national housing policy has been properly implemented under the present government unlike in the past. “Even though there are some good housing policies, most of our people do not like to abide by them. People also take advantage of the weak construction and housing policies existing in the country. Land availability is dwindling every day. It’s important that we safeguard the remaining lands,” he said. 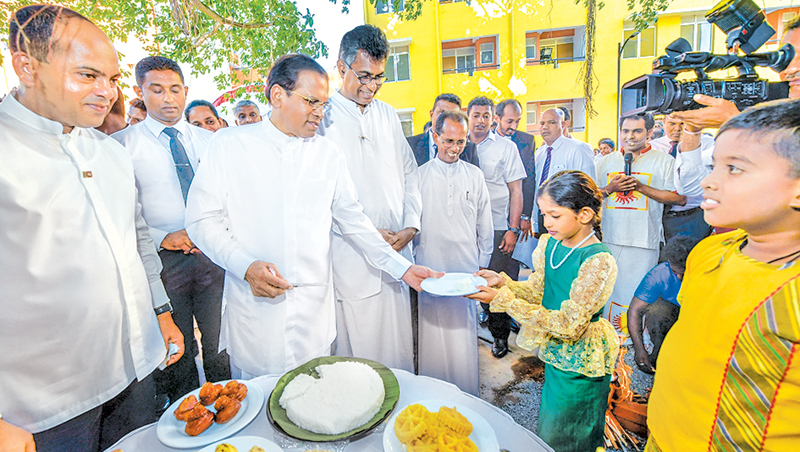 President Maithripala Sirisena made these observations participating in the ceremony held to hand over the “Lake Crest Residencies”, a housing project with 500 apartment units, to the public at Mulleriyawa, Mandawila. The housing project is constructed under the directions of Megapolis and Western Development Ministry together with financial and planning contributions by the Urban Development Authority. “The forest density of the country at present is 27%. Each year, the forest density decreases by 1.5%. If we continue at this rate, in the next 10 years, we will have a forest density only of 18%-19% or so. In about 25 years, our country would become a desert. There would be no difference between the Middle Eastern countries and ours. Therefore, it is crucial that we adopt a construction and housing policy which recognises the importance of forest conservation,” the President added. Speaking further, President Sirisena observed that the present government had to bear the burden of not only of one, but many “garbage mountains,” when it took over from the previous Rajapaksa regime. “The government had to face the Meetotamulla garbage dump tragedy. But, the Meetotamulla dump was not created by our government, but it was us who had to pay for it. When we took over, Sri Lanka had lost all its international allies. That was another “garbage mountain” we had to clear. We have now won the support of many countries. SAITM was another “garbage mountain” we had to deal with. Many have criticised and mocked this government but these are some of the issues we had to overcome,” President Sirisena added. President Sirisena commended Megapolis and Western Development Minister Patali Champaka Ranawaka for the exceptional commitment he is making to uplift the living standards of the people by implementing solid infrastructure and development projects. Colombo district UNP MP S.M.Marikkar and Kolonnawa Development Committee Co-Chairman Prasanna Solangarachchi were also present at the occasion.